The Boston native sang one of the legendary folk singer's own tunes. 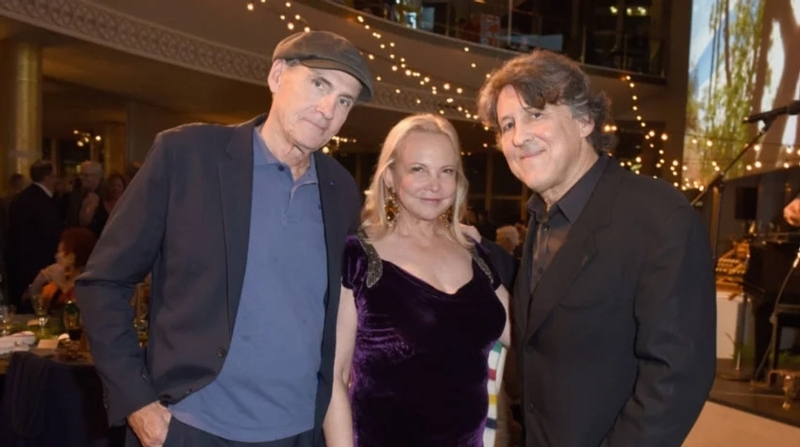 James Taylor was among a slew of stars who paid tribute through song to Joni Mitchell at the legendary folk singer's two-night, star-studded 75th birthday bash in Los Angeles earlier this week. Musicians like Norah Jones, Kris Kristofferson, Graham Nash, and Rufus Wainwright serenaded Mitchell with a selection of her own tunes as part of the Tuesday and Wednesday celebration held by The Music Center at its Dorothy Chandler Pavilion. The penultimate song of the event came from Taylor, Mitchell's longtime friend, onetime lover, and occasional collaborator. The Boston native performed a rendition of Mitchell's "Woodstock," with backup vocals provided by Seal. For a finale, the majority of the artists present gathered onstage for a performance of "Big Yellow Taxi," with Mitchell herself rising from the audience to join the sing-along. It was a rare public appearance for Mitchell, who also met up with Taylor in June when he performed at LA's Hollywood Bowl. Following the Wednesday concert, the Music Center further honored Mitchell with a gala, "The Music Center's Soirée: JONI 75," at which Mitchell was awarded the center's Excellence in the Performing Arts Award for her "pioneering spirit and timeless art and music," according to a press release. Mitchell received the award from legendary rock journalist Cameron Crowe, another longtime friend of Mitchell's. "She remains our best field reporter in matters of the heart, or in the world...or if you're just looking for an excuse to kick up your heels and feel more alive," Crowe said while presenting the honor, according to the release. "She is heavenly inspiration at a time when heaven is in short supply." This article has been viewed 554 times since being added on November 9, 2018.